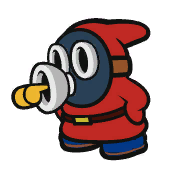 Whistle Snifits are a variant of Snifits that appear in Paper Mario: Color Splash. They will blow a whistle to call in more enemies such as Paragoombas, Spikes, and Hammer Bros. during battle. They come in red, blue, green, and yellow. The red and blue Whistle Snifits are only found in Fort Cobalt, green Whistle Snifits appear in both Fort Cobalt and Mustard Café, and the yellow Whistle Snifit only found in Mustard Café. Whistle Snifits attack by shooting three bullets at Mario. Quotes Fort Cobalt: "Hmm... The front line seems a little risky." ~ "Quitters never win!" ~ "Winners never quit!" ~ "Do it for the Magma Burgers!" ~ "Go hard or go home!" Mustard Café: "You're jealous of my mask. Admit it." ~ "You're in spitting distance!" ~ "Noxious fumes are nothing to me!" ~ "Pew pew!" Quotes Usual: "Hmm... The front line seems a little risky." ~ "Quitters never win!" ~ "Winners never quit!" ~ "Do it for the Magma Burgers!" ~ "Go hard or go home!" Spanish Olfiti Olfato (Smell) and Snifit. This page was last edited on April 13, 2019, at 15:40.